"The vote against the measure was 228 to 205, with 133 Republicans turning against President Bush to join 95 Democrats in opposition. The bill was backed by 140 Democrats and 65 Republicans." Apparently, Nancy Pelosi made a cranky speech before the vote, saying it was all the Republicans' fault that we were in this mess, and it didn't go over well with some of the Republicans. "Immediately after the vote, many House members appeared stunned. Some Republicans blamed Ms. Pelosi for a speech before the vote that disdained President Bush’s economic policies, and did so, in the opinion of the speaker’s critics, in too partisan a way. 'Clearly, there was something lacking in the leadership here,' said Representative Eric Cantor, Republican of Virginia. Democrats, meanwhile, blamed the Republicans for not coming up with enough support for the measure on their side of the aisle." I don't know whether the bailout is right or wrong. I do wonder whether, if Ms. Pelosi wanted the bill to pass, why she would have said something partisan right before the vote which she knew would anger Republicans. Or, maybe she didn't want it to pass, and can blame the Republicans now for not voting for it. All I know is, the stock market fell 778 points today, the biggest single loss since Black Monday in 1987. In the meantime, Wachovia, the country's 4th largest bank, is being gobbled up by Citigroup. 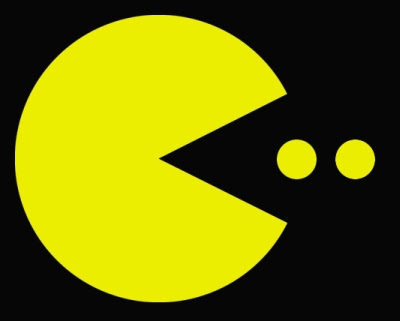 There are so many buyouts and mergers going on this month that it's like watching a game of PacMan. The Times had an interesting chart in their Sunday Business section showing how the various investment firms had gradually been swallowed up over the years. It really started back in the 1980s. Remember E.F. Hutton, founded in 1904 ("When E.F. Hutton speaks...")? Became part of Shearson-Lehman-American Express in the 1980s. Then Lehman Brothers was spun off later on, and we know what happened to them. Remember Salomon Brothers (founded 1910)? Now part of Citicorp. Smith Barney? Yep, Citicorp again. What about Dean Witter? Remember that name? They were around since 1924. They're part of Morgan-Stanley, which is turning into a bank holding company and will be subject to greater regulation. Then there's Paine-Webber (remember "Thank you Paine Webber")? Now part of UBS Securities. The chart is an interactive chart that is part of an article called Wall Street, R.I.P., and it really brought home how consolidated all of these firms have become, and how the basic way Wall Street functions will be changed in the future, no matter what happens with the bailout. "The huge bailout package being debated in Congress may succeed in stabilizing the financial markets. But it is too late to help firms like Bear Stearns and Lehman Brothers, which have already disappeared. Merrill Lynch, whose trademark bull symbolized Wall Street to many Americans, is being folded into Bank of America, located hundreds of miles from New York, in Charlotte, N.C.
For most of the financiers who remain, with the exception of a few superstars, the days of easy money and supersized bonuses are behind them. The credit boom that drove Wall Street’s explosive growth has dried up. Regulators who sat on the sidelines for too long are now eager to rein in Wall Street’s bad boys and the practices that proliferated in recent years." Personally I think that's a good thing. But what isn't a good thing, in my opinion, is consolidating even more money and power into the hands of even fewer financial institutions. If those regulators don't keep an eye on them in the future, we may be facing an even bigger mess next time around. 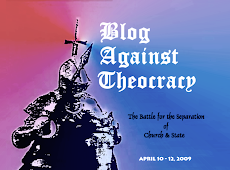 I have some serious blogging I need to do - Spartacus has tagged me for the political meme - which I'm really looking forward to having the time and energy to do - and Christopher very kindly honored me with an award a few days ago, which I want to pass on to worthy bloggers. But I've had a hectic week; lots going on at work, and for the first three nights of the week I've been out every night at meetings (non-work). So the energy level just isn't there tonight, especially after watching three straight hours of political commentary (Keith Olbermann, Rachel Maddow, Jon Stewart and Stephen Colbert). So, like John McCain, I'm going to wimp out. I'm going to write a few haiku and go to bed! Tomorrow, as Scarlet O'Hara liked to say, is another day. He knows he can't win. No deal has been reached. I found this "Obama Quote Generator" - here's what my inputs resulted in! Try it and have some fun. I'm looking for one on McCain...if I find one, I'll post that too! Generate a Barack Obama Quote! 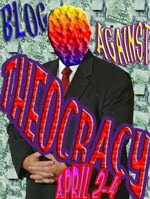 Wall Street financiers, they just aren't sure if their leaders believe in progress." Tonight is the last game being played in the old Yankee Stadium. The brand new, flashy ballpark rising next door will be ready in time for opening day 2009. 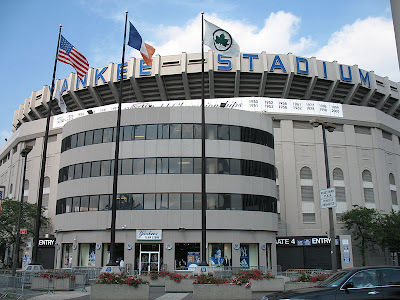 Since the Yankees won't be making the playoffs this year, that made tonight the last home game of 2008 and the last ever in this fabled stadium. We happened to turn on the Yankees' cable station, the Yes Network, tonight just in time to see the opening ceremony before the game. It was a long and moving ceremony, hosted by the two voices of the Yankees, John Sterling, the radio announcer who has been calling their games for the past 19 years, and Michael Kay (who was Sterling's radio partner from 1992-2001), who is now the team's television announcer. The ceremony began with the two men announcing the original lineup that played on the first opening day at the stadium, April 18, 1923, with men dressed in the old uniforms from that era running out onto the field as if they were the original team. After all, the ghosts that have helped the Yankees win 26 world championships had to be represented. Then the announcers began going through each position on the team - first base, second base, third base, right field, center field, left field, catcher and pitcher - while images from each era of the stadium were projected on the big screen...from old black-and-white scratchy films of the Babe hitting a home run, to faded films of Mickey Mantle; old videos of the teams of the 70's, and the more recent videos of the great Yankee teams of the 1990's. After each highlight film, the still living players for that position were introduced one by one, and they ran out to take their place on the field where so many great players have played. Players that took the field ranged from old-timers like Bobby Richardson, Don Larsen and Whitey Ford, to players from the great team of the 70's, such as Graig Nettles, Reggie Jackson, Ron Guidry, Goose Gossage and Willie Randolph, to the heroes of the Series-winning teams of the 90's - Scott Brosius, Paul O'Neill, Bernie Williams, David Wells and David Cone (both of whom, like Larsen, pitched perfect games in the Stadium) and Joe Girardi, who is now the club's manager. In some cases, the widow or family of those who are no longer with us represented the missing players. Mickey Mantle's son, Bobby Murcer's family, Roger Maris's son, Elston Howard's daughter, Catfish Hunter's widow, Thurmond Munson's son...all took the field dressed in Yankee pinstripes bearing the players' numbers. By the time they got to Phil Rizzuto's widow Cora, I have to say there wasn't a dry eye in the house - at least not in our house. And of course, Yogi Berra was there, and trotted out to take his place on this field where he played, coached and managed. And at the very end, Jorge Posada, the current catcher who has been sidelined by an injury, came out to catch the ceremonial first pitch - thrown by none other than the daughter of Babe Ruth, Julia Ruth Stevens, who must now be about 90 years old. I hadn't been to Yankee Stadium in person very much. My history with the Yankees is somewhat complex, since my mother, who hails from Massachusetts, brought me up as a Boston Red Sox fan. Throughout my childhood through the mid-1980's I generally rooted for the Red Sox. But of course, living in New Jersey, I was constantly exposed to the Yankees. I remember when I was very young, sitting at the breakfast table eating my cereal and seeing Whitey Ford and Mickey Mantle on the Wheaties box in front of me. 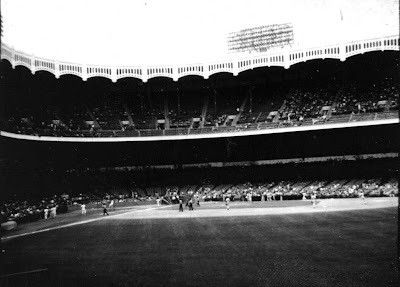 In 1971, I went to Yankee Stadium for the first time, with a high-school friend whose father had access to box seats. This was the old Yankee Stadium, before the mid-1970's renovation that made the huge field smaller and ripped off the famous facade that encircled the inside of the stadium. Our seats were right above first base and I remember the Yankees lost to the Kansas City Royals, 11-7. During the 1970's I had a boyfriend who was a huge Yankees fan, and I grew quite attached to the Yankees of that time. We spent a lot of time watching baseball, as we didn't have much money to go out! This was the era of Reggie Jackson, when the Yankees won the World Series in 1977 and 1978. 1978 was the year of the famous comeback, when they chased the hapless Red Sox, who were up by 14-1/2 games on July 14, until it all came down to one last sudden-death playoff game on the last day of the season at Fenway Park. The Yankees' Bucky Dent hit a 3-run homer to put the Yankees ahead, and the rest, as they say, is history. Although I felt bad for the Red Sox, I had no problem rooting for the Yankees in the playoffs and the World Series - which they won against the Dodgers. I went through a long dry spell where I didn't really pay that much attention to baseball, but kind of reverted to being a Red Sox fan - very cautiously. By then I had met DH and we were married in 1985, so we'd been too busy to pay much attention to the game. However, DH had always been a Yankees fan, and when they started to do well again in the mid-1990's, we started watching the games faithfully, and I got to know a whole new team of Yankees. In 1996 I'll never forget the tension in the 5th game of the World Series, when pitcher Andy Pettitte pitched the game of his young life, and was taken out in the 8th inning with the score still 1-0, Yankees vs. the Braves. Pettitte was sitting in the dugout with a towel over his head, afraid to watch, while John Wetteland closed out the game, preserving the win. The second time I was in Yankees Stadium was with DH during that era, when we watched them lose a game (I am now forgetting who it was against) but did get to see some of our heroes in person, including Paul O'Neill, who was playing far beneath us in his usual outfield position. From where we were sitting, he looked like an ant. I attended another game as part of a corporate outing a couple of years ago (our boss took our whole group there on a sunny summer afternoon), and as I recall they lost that time too. This summer DH and I made sure to go to one last game at Yankee Stadium. We chose August 27, when they played the Red Sox - quite appropriate, since they played the Red Sox on that first opening day in April 1923. We saw Derek Jeter, Mariano Rivera (who didn't pitch but was in the bullpen at one point) and all the rest of the current team. It was a night game, and yes - they lost again, 11-3. I guess I'm just a jinx. The last game in Yankee Stadium is still being played as I write this. They are playing the Baltimore Orioles, another old American League team. (I'm glad they're not playing one of those newfangled teams like the Diamondbacks or the Tampa Bay Devil Rays.) The score is tied, 3 to 3, and Andy Pettitte is pitching. Somehow that seems appropriate. In between plays the announcers are chatting with Whitey Ford and Yogi Berra, who are in the broadcasting booth. And they're showing films of great moments in Yankee Stadium during breaks. There is truly the sense of history being made. Next year the Yankees will still be playing in the Bronx. It's not that far from the old Yankee Stadium to the new one rising next door. But will the ghosts travel that far? Only time will tell. Baxter here. I have to tell you, I have had a Very Bad Week. On Wednesday evening I used my Box a lot but didn't Do Much, if you know what I mean, and my Female Human dragged me off to the Emergency Clinic at 9 o'clock at Night. Usually it is That Dog that gets dragged to the Emergency Clinic because of fear of something called Bloat (which always turns out to be Simple Indigestion and is curable with a dose of Pepcid, after my Humans spend hundreds of Dollars). But this time, it was My Turn. About Time they spent some Real Money on Me. After all, I'm Worth It. I was Taken into the Back and poked and prodded and returned to my Human with a bottle of Disgusting Medicine. The Vet claimed it is Chicken Flavored. Bah! My Humans forced open my Mouth the next Morning and squirted it in and it was the Most Foul Tasting Stuff I've ever had the Misfortune to Taste. Ugh. It made me Foam at the Mouth. Then yesterday my Male Human dragged me off to the Regular Vet to have what he called an "Ulstrasound." I have No Idea what happened because I fell Asleep very Suddenly after they took me into the Room to do it. When I woke up my Stomach was Naked. Yes, Someone shaved my Stomach while I was Asleep! The Nerve! It is really Embarrassing to have a Naked Stomach when you're a Fine Figure of a Cat. Apparently Nothing Bad showed up in the Ultrasound and they are just continuing to give me the Disgusting Medicine. In fact, my Female Human is walking around the House calling to me with that Squirt-Thing in her Hand, trying to give Me another Dose of it. Little does she know I have now Sneaked Upstairs and am Blogging. If I hear her coming I may have to stop and run under the Bed for awhile, but I'll be Back. So, I'm finally getting back to Normal and am ready to talk about this past Week. "Nobody understands who owes what to whom — or whether they have the ability to pay. Counterparties have become afraid to trade with each other. Sovereign wealth funds are no longer willing to supply badly needed capital because they no longer know what they are investing in. The crisis continues because nobody knows what anything is worth. You simply cannot have a functioning market under such circumstances." Then there's this whole thing about Short Selling. Everybody is Upset about it and suddenly it is being Controlled - which is probably like the old Saying, "Closing the Barn Door after the Horse is Gone." "Short sellers aim to profit from share declines, usually by borrowing a stock, selling it and buying it back after its price has decreased. In abusive 'naked' short selling, the seller does not borrow the stock and fails to deliver it to the buyer." So for instance, our Neighbor, Ethel, has a lot of Cats. She has a lot of Cat Food out on her Porch for her Cats. It's as if I, Baxter, said to you, "Tell you what. I'll sell you Ethel's Cats' Food for this price." But I don't even have that Food. It's on Ethel's porch. That's about as far as I can understand this Complex type of Transaction. It sounds kind of Fishy to Me. I know I'm just a Cat, and not a Financial Wizard. But it seems to me that this kind of Wizardry may have gotten us into this Predicament. I hope my Humans will still be able to buy my Cat Food. That is all I care about. So Far so Good in that Department. However, I don't think this Mess is Over Yet. The underlying Problems are Still There. "'What we can say is that volatility is extremely high by historical standards,' said Ken Tower, senior vice president at Quantitative Analysis Services. 'We've now weathered this recent storm,' Tower said. "If somebody wants to talk to me about a two or three months rally, then OK. But it's not the end of this overall downturn, with the economy still going down the drain.'" On the Bright Side, the Economy's problems seem to be a Big Help to the Obama Human in his Fight against the McCain Human. The latest CBS Poll taken in mid-week shows he has regained the Lead from the McCain Human, 48% to 43%. And also, fascination with the Palin Human may be Waning, which can only be a Plus. And in Other Good News, the Hillary Clinton Human is really Stepping up to the Plate, showing that those who doubted her Commitment to the Democrats were probably Wrong. She has begun an effort named "Hillary Sent Me" and is urging her Supporters to go to Other States and campaign for Obama, and donate to the Cause. A friend sent me a link to this site: Grizzly Bay, which has a whole page entitled "The Truth About Sarah Palin," which is where the link will take you. The site also links to the Defenders of Wildlife Action Fund, where you can donate to help get the following ad on air, exposing the barbaric practices Governor Palin endorses in Alaska. Have you ever heard of aerial wolf hunting? It's a brutal practice. Wolves are shot from low-flying aircraft or chased to exhaustion, then shot and killed at point-blank range. Governor Sarah Palin, the Republican nominee for Vice President, promotes this barbaric practice, exploiting a loophole in the Federal Airborne Hunting Act to allow private wolf killers to shoot down wolves using aircraft. We have to get the word out about this! Here is the video embedded for your convenience. Please note, it is graphic and upsetting so don't show it to children or watch it if you think you will be upset. I know I was. We cannot have this woman a heartbeat away from the Presidency. We just can't. While McCain whines that Obama was referring to Palin when he used the phrase "lipstick on a pig," and the federal government refuses to step in, Lehman Brothers is going down the tubes, possibly pulling AIG with it, while Merrill Lynch will apparently be acquired by Bank of America. In a sign that creditors don't expect Paulson to blink, the cost to protect against defaults by AIG, Merrill, WaMu and Wachovia Corp. reached records. Credit-default swaps on Seattle- based WaMu are trading at levels that imply a 75 percent chance the company will default in the next five years, a JPMorgan Chase & Co. valuation model shows." This may only be the beginning. According to the New York Times, there is concern that the wave of failures will inspire certain fund managers to look for other weakened financial institutions and try to make a fortune by selling them short. So where do we go from here? Is this the start of a new Depression, or will the wizards of Wall Street manage to stop the dominoes from falling? Only time will tell. But I do know it is a sign that something is very seriously wrong with our economy, and despite all of these important issues, the only thing the media can talk about is the "lipstick on a pig" controversy. I am starting to lose hope for this country. The latest polls show that McCain continues to gain on Obama and now the electoral vote is no longer in Obama's favor. If the American public doesn't wake up and start realizing that the McCain campaign is playing them for fools - just as George W. Bush has done for 8 years - we may get McCain and Palin in the White House. And here we thought maybe, this time, they wouldn't be so stupid. But as H.L. 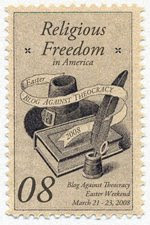 Mencken said, "Nobody ever went broke underestimating the intelligence of the American public." "The men the American public admire most extravagantly are the most daring liars; the men they detest most violently are those who try to tell them the truth." Unfortunately, Mencken was apparently a very wise man. Here it is again, September 11. It's been seven years. The memories are starting to fade a little, the world is moving on. Construction is finally starting on the Ground Zero Memorial. This may be the last year that the memorial service will be able to include a descent into the crater that the devastation left there. This morning I almost forgot the date. Then when I turned on the radio I heard Mayor Bloomberg speaking about September 11, 2001, and I remembered. On my way in to work I heard part of the annual recitation of all of the names of those who were lost on that day. That always affects me, even if I think I'm going to be OK at first. Seven years is a long time. Babies born to those who died that day have grown into children, children who don't remember the parent or parents that they lost. Teens who were young children when they lost a parent still remember their mother or father, but the memories are growing distant. Wives or husbands may have grieved, moved on and married again. Or not. Parents who lost a child may have started to accept it; but will never forget or be consoled. Life has continued on for all of us. Even thinking back to where I was on that blue September morning, so much has changed in my own life. Since then, my father died, I lost three friends to cancer, my mother and aunt moved out of their homes into apartments, friends of mine have married, my mother-in-law entered a nursing home, I completed a certificate course in historic preservation, my job has changed in several important ways, my husband stopped working in New York and changed his career path as well. All of you can think back on your last seven years and see how far you've come down the road since that morning. But once a year, on September 11, we all return to that day together. We all think back on what we were doing, how we heard about it, what we remember. Suddenly it is all there; the panic, the fear, the foreboding. What if there are more of them? Will there be another attack? How many planes are actually missing? Do I know anyone who might have been there? What about my neighbor? Doesn't he work in the Towers? The sudden shock when the Towers collapsed. The screams of the people in the videos shown, over and over, of the planes hitting the buidings. The endless smoke from the ruin over the next months, with that image of the remaining pieces of the structure jutting into the smoke-filled sky, shown over and over on television while the news covered the massive cleanup. The made-for-TV specials, the documentaries, the conspiracy theories then followed. But in the end, it seemed that a bunch of low-tech terrorists just got lucky with a plan that included box cutters and exploding jets; they took advantage of our trust and our free society, and were able to inflict a terrible wound. Could it happen again? Yes, of course. Nothing we have done in the past seven years would prevent another attack like this. Whatever precautions are taken now only prevent the same thing from happening again. Not something different. Here is an example: Only three ounces of any one liquid are allowed on a plane. But there are plenty of ways to bring separate ingredients aboard that can then be combined into an explosive and detonated once aboard. See this Washington Post article for more details. For the past seven years our government has wasted effort, time and treasure - not to mention uncounted thousands of lives - attacking Iraq, which had nothing to do with the September 11, 2001 horror. This debacle has actually made us less safe by strengthening Iran and provoking more people around the world into hating the U.S. While we can never feel completely safe again, there are other ways we could be trying to track down terrorists who may attack us again. Going to war in a conventional manner is not one of them. Today both Barack Obama and John McCain will go together to Ground Zero to pay their respects to the dead. Since they are putting aside politics for this day, so will I.
Baxter here. I am feeling a bit Grumpy. Not only didn't I get to Blog for Much Too Long, but I had to sit through that Debacle called the Republican Convention two Nights in a row. Usually my Humans sit out on their Deck for the Evening in the warm weather and leave me to my Own Devices. Well, Wednesday and Thursday evenings they sat Inside and watched the Convention. They were both Curious about this Palin Human that was chosen by the one called McCain to be his Sidekick. Wednesday Evening I joined them for the main Reason that they were eating Salmon for Dinner. And I really like Salmon. So I sat in my Female Human's Lap and cadged some Salmon while we watched the speeches. The first one was by that Guiliani Human. What a crass fellow HE is. No self-respecting Cat would have said the Obnoxious things he did. He spent his whole time making Fun of the Obama Human. He went on so long I'm surprised they didn't pull him off the Stage with a Hook. But the Crowd ate it up. Then the Palin Woman finally came on. She wasn't any better. She babbled on about her "Executive Experience" running a State that has a Population less than most major Cities in New Jersey. 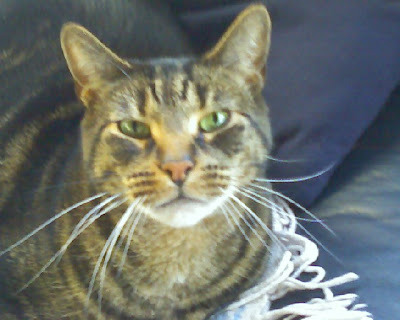 My Female Human says when she reads about what her "Experience" consisted of, it reminds her of the small-town Politics in the Town we live in (which has almost 10 times the Population of the Town where the Palin Woman was Mayor in the 1990's). And then the Palin Woman had the Nerve to make fun of the Obama Human too! Talking about him being a "Community Organizer" as if that was a Bad Thing. 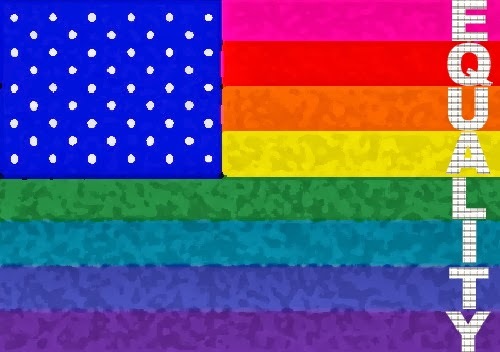 I'm only a Cat, but aren't the Republicans the ones who tout their "Family Values"? Isn't helping the Community a good Value? You may notice I am not calling her the Palin Human. I haven't quite Decided whether she IS Human or not. She may be some kind of Doll that walks and talks. The speech she gave sounded Suspiciously as if it was a Script coming out of her mouth in many places. Maybe it was recorded and then they pull a string in the back of her to make her talk? The whole Scene left a bad taste in this Cat's mouth that all the Salmon couldn't wash away. Some of you have likened it to a Nazi Rally. I have seen Nazi Rallies on the History Channel (yes, we Cats really ARE watching the Television while we sit there next to you purring). And I can see the Resemblances, which is a Scary Thought. My Female Human felt it was highly immature, juvenile Behavior, and a Stark Contrast to the Democratic Convention from last Week. Chanting "Drill, baby drill!" and "USA, USA"? What is this, a High School Pep Rally? As a Cat, I have my own Perspective on it, which is, of course, why you come here to read my Posts. After all, it's always good to have another View of things, right? To me, it reminded me of a Pack of Dogs in a fenced yard, seeing a Cat on the other side of the chain link fence. They can see the Cat, smell the Cat, but they can't get the Cat. But that doesn't stop them from barking, yapping, slobbering and jumping at the fence. They're Stupid, you see. And the Cat knows they can't get him, so he sits there and washes his Face and ignores the Dogs, which makes them even Madder. They taunt the Cat, tell the Cat what they'll do to him if they get him, but it is all Noise. The only thing the Cat has to worry about is if the Fence falls down. Then no matter how Stupid and full of Bluster the Dogs are, a Pack of them can run that Cat into a Corner and kill it. Right now the Fence is the Unpopularity of the current Government which has been run by the Republicans for 8 years. If the McCain-Palin Combination manages to Convince the American Public that they really ARE "Mavericks" - the Fence will start to weaken. So the Cat needs to be ready if that happens and have a Plan to Fight Back in order to Outwit the Dogs. 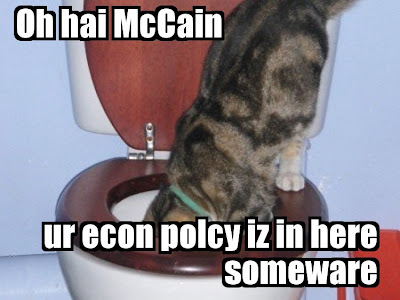 The last night of the Convention the McCain Human spoke. But first they had a long Dramatic Video about his Life, with a Lot of Emphasis on his family's Military Service and then his own. It was very Inspiring. However, it reminded me of watching those really old Films on the History Channel. The ones that are from so Long Ago that they're scratchy looking and sepia-toned. It felt like Ancient History. 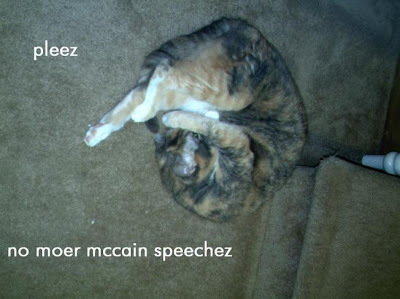 Then when the McCain Human shambled on to the Stage, he didn't make up for that image. At one point he mentioned remembering when Pearl Harbor was Bombed. This Human is seriously Old! At least his Speech wasn't devoted solely to bashing the Obama Human. But it was very rambling and disjointed - and his Audience kept interrupting him with "USA USA." What is up with that? Don't they WANT to hear their own guy speak? Maybe not, a lot of them looked Bored. The really ironic thing was when he vowed to end "Partisan Rancor." After that Display the night before? Who is he Kidding? I have to tell you, this Cat is already Exhausted and we still have 2 Months to go! Let's hope this Election turns out the way we Hope. I think in the meantime I'll load up on the Catnip, and leave you with this, from YesWeCanHas.com. We just returned from our trip to the Adirondacks and I thought it was time for an update on the purchase of the property we’re buying near Lake George. The perc test is done, and the soil tested well. (For those who don’t know what a perc test is, it’s a test to see how well water “percolates” through the soil). This is something that is necessary if you want to put in a septic system. The cabin we’re buying doesn’t have one; it has a simple holding tank. We wanted to know whether we could upgrade to a septic system one day, and were glad to hear that we could. We have also hired the surveyor to survey the property; he is supposed to be doing this in the next week or so. And we got the word today that our attorney has received the results of the title search, and all is well in that regard. While we were in the area over Labor Day weekend, we took the opportunity to visit the property a few times. The first time was to test whether our car can get up the steep gravel roadway. When we first went to the property with the realtor, she drove us up in her 4-wheel-drive SUV, as she wasn’t sure our car could make it. We were very pleased to find that our Saab 9-5 wagon went up the road with no problem whatsoever. In the winter, it might be another story, but we’ll worry about that later! The first visit was on a cloudy day, with slightly threatening skies. When we pulled into the yard, we were surprised to see that the pond’s look had changed since our last visit – no longer looking like primordial pea soup, the pond was now clear and dark, still mysterious, but with no algae bloom at all. Apparently it is only a seasonal problem. As we got out of the car, we noticed several disturbed areas of the water, and realized there were several small heads poking above the surface. As we watched, they swam around, and one of the creatures started squeaking at us. Apparently we had disturbed a family of otters that like to visit our pond! They were not happy about our appearance. Two of them disappeared from view, but the head of the clan continued to express his (her?) displeasure at us and at Diva, who was quite interested in his presence! From what we can figure out now that we’ve Googled them, they are apparently Northern River Otters. If anyone else has any idea whether we are correct or not, please let us know. It's kind of hard to see in this picture as the closeup is blurry but they have little narrow heads that stick out of the water like miniature Loch Ness Monster heads. On the outer wall of the house facing the deck, we had noticed at our first visit that there were areas where the paint and part of the wood had been worn off. We had speculated that perhaps deer come up and rub their antlers there. When we returned this time, there were further areas worn off. Diva was extremely interested in these areas, and sniffed and rubbed her own shoulders on them, and finally decided it was worth rolling around on her back about. The next two times we visited the property were for no good reason except to walk around and look at it again. Both of these visits were on beautiful sunny days, so DH took a few more pictures of the pond and the cabin. Updated: One more of Miss Diva, impatiently waiting to go on a walk! I’ll continue to keep you posted! For those of you who are fans of Baxter, he will be posting in the next entry, including his special view of the latest political scene.